The TNH Outdoors Double Camping Hammock is a generic, three-panel, open, gathered-end hammock that includes some fantastic straps and carabiner set. It uses the common 70D/210T crinkle taffeta “parachute nylon” fabric that is common with most mass-market hammocks on the market, including the popular ENO Double Nest. However, the price is absolutely killer. TNH has a great deal on a hammock + strap combo. 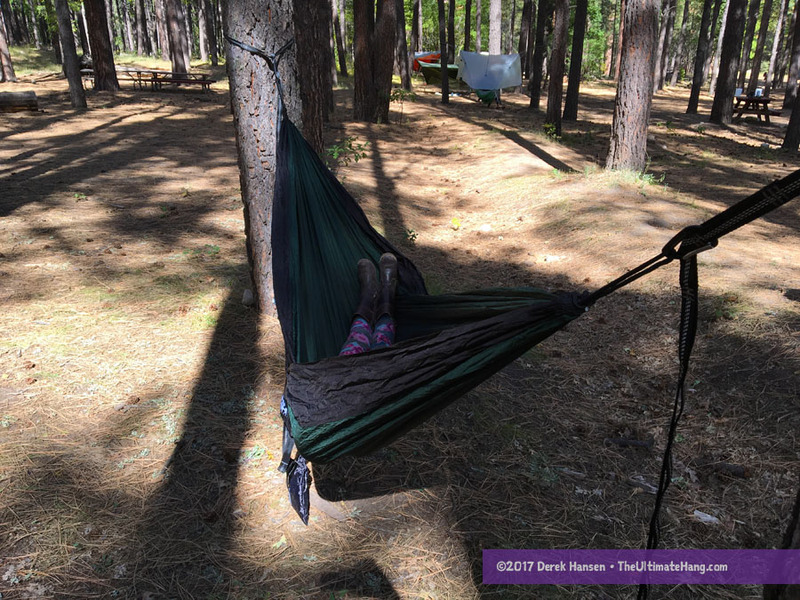 The hammock is unsurprisingly similar to the ENO Double Nest, down to the size, color combinations, and side stuff sack with compression strap. The stuff sack is a little small, so the compression strap isn’t really helpful since the hammock is already so tightly packed. I would have liked a little roomier sack for easier stuffing. The suspension straps are one-inch wide and nine feet long, which is a little shorter than most daisy chain style straps. For most hangs, this length won’t limit you too much. The straps include reflective tracers, which is a nice touch for added visibility in low-light conditions. There is nothing extraordinary or surprising about the hammock itself. There are so many copy-cat hammocks on Amazon.com these days that it’s hard to differentiate one from the other, and in material respects, the TNH hammock is just one of the crowd. For me, what I look for in these hammocks is if they live up to any claims, such as dimensions, which can often be misleading. For example, weight capacities on the same material can vary from company to company from 250 to 500+ lbs. Some brands do use thinner fabric, so it is important that you always check to see what they claim. The fabric on the TNH feels exactly like an ENO, and the stitching and construction is nearly identical. All things being equal, the TNH hammock is a good brand, even if the hammock is generic. The straps and carabiner set are what make this hammock a great bargain, even if the straps are a little shorter than most. The reflective tracer is a nice touch and the material is robust and well-made. Their website and corresponding Amazon.com listing don’t agree on the specs, unfortunately. When I measured the hammock, it was 114 × 72 inches, which doesn’t match either websites. One thing that TNH is trying to add to their business is social responsibility. I’ve had a few email conversations with them about their sustainability initiative, something that I’m quietly passionate about. For their company, they want to be identified for their eco-friendly approach, but they are just getting started on that front. Sourcing sustainable materials while also being a mass-market brand is a bit of a challenge. The are making a few steps in that direction by including a biodegradable-friendly plastic bag as part of their packaging, and recycled aluminum stakes (not something I reviewed). It’s a token effort, and the bag may be a little counterproductive, but I appreciate the intent. I have high hopes that TNH can break out into the niche market and offer more sustainable and environmentally-friendly hammock products. I’ll be first in line. Suspension and Anchor System ♥ ♥ ♥ ♥ ♥ The included strap set and carabiners are fantastic, but the straps are a little shorter than most. The carabiners are high-quality and a great deal. Construction and Craftsmanship ♥ ♥ ♥ ♥ ♥ Good craftsmanship; straight, even stitching; reinforced; quality materials. Few loose threads. Modularity ♥ ♥ ♥ ♥ ♥ Open, gathered-end hammock has lots of modular options. Aesthetics ♥ ♥ ♥ ♥ ♥ Generic. Price and Value ♥ ♥ ♥ ♥ ♥ One of the best prices for an open, gathered-end hammock for general recreational use, especially considering the suspension and straps are included, along with quality carabiners. We have 4 TNH hammocks. They go every where with us. Not one issue so far. My son has his friends come over and they hammock camp out in the back woods. I can tell you they have received their fair share of abuse. Here is my only complaint. We don’t have enough and need more. Bought some other brands that have come and gone. These look to be around for the long haul.